We’ve been working with Ivan De Miguel, from Spain, for about a year now. Back then, Ivan only had a concept, for an innovative electronic device now called SonicBeer. Today, after developing his prototype in Shenzhen, he has finally launched his product on Kickstarter. In this interview, Ivan explains how he came up with this idea, and the challenges he faced along the way. I’m originally from the Basque Country, a region in northern Spain. I studied Biology and Biomedical Physics, with electromagnetic fields and its impact on live systems. I also participated in the maker and biohacker community, co-founding various associations, and organizing conferences. 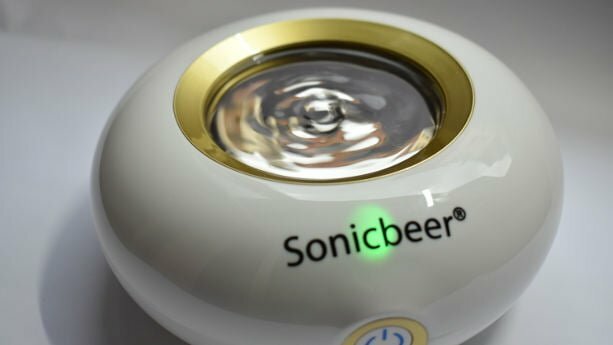 I got into various entrepreneurship programs to research about using Ultrasonic technology in fermented beverages, which lead me to develop a product called SonicBeer. You have a unique product. What exactly is SonicBeer? 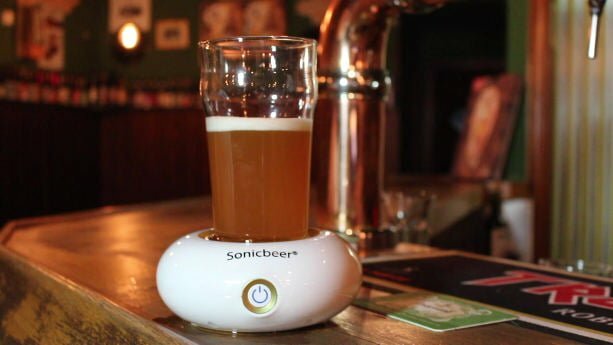 SonicBeer is a minimalist and elegant beer enhancer, revitalizes the beer. Let me explain how this work. “As we drink the beer the foam disappears and with it the aroma and flavor. The beer foam is the natural defensive layer that protects it from oxidation and retains volatiles. That’s why for all those beer lovers who value the small details we have created SonicBeer. We use technology to generate ultrasonic waves that excite the carbonated volatile components inside your beer by cavitation breaking some of the intramolecular interactions, generating foam with aromatic compounds in just a few seconds. Now you can experience a better beer tasting experience with original foam, aroma, and feel. The technology itself is related to the “cavitation effect” of the ultrasonic waves into carbonated liquids. Ultrasonic waves create small vacuum bubbles or voids in the liquid. Well, during my studies I realized that most of the technology developed at universities never make it to the consumer market. Additionally, the “Maker Movement”, or more specifically the biohacker community in terms of bio-prototyping, is trying to fix this. But, despite its attempts, projects with high research requirements never get completed due to long execution times and high costs. Because of this, I decided to start the journey, but from the opposite direction. SonicBeer is born with this mentality, not only to launch a family of innovative products and services, but to make real the advances that, sadly, do not usually come to life in universities and research centers. Sonicbeer applies ultrasounds to the beer improving the user experience, but ultrasounds can also be used in brewing processes to increase the alcoholic degree of a beer. This is just an example of why we are here. Our competitors mentality is different, as it’s more commercial based. You signed up for the Starter Package in mid-2017. Why did you come to us? You offer a well-organized platform for Importers, with a lot of accurate information and updates, at a very competitive price. But what surprised me most was your support. Chinaimportal.com answered every question and solved any problem that I had during the product launch process. We always a very good and personal communication. I really admire your job and respect what you have created here. How do you think that the Starter Package helped you in the product launch process? 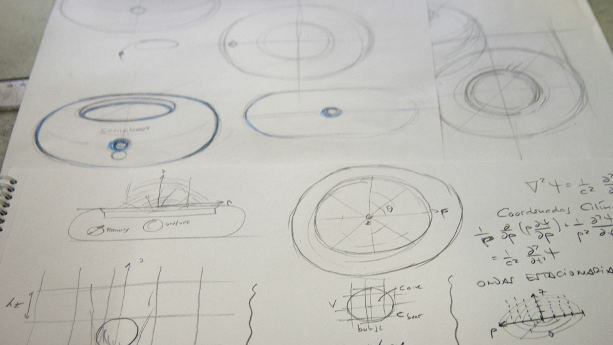 For example, during the product design process, having a full understanding of all the company processes, is fundamental. If you want to ship your product by airmail there exists relevant legislation about components, weight, dimensions and so on. Despite shipping being the final step, you have to take care of that from the very beginning of the product launch process. This includes, for example, tweaking the product design. That’s why SonicBeer does not include a lithium battery, for example, as that would have complicated the delivery process. That is one example of the things that I learnt through the tutorials in the Starter Package. 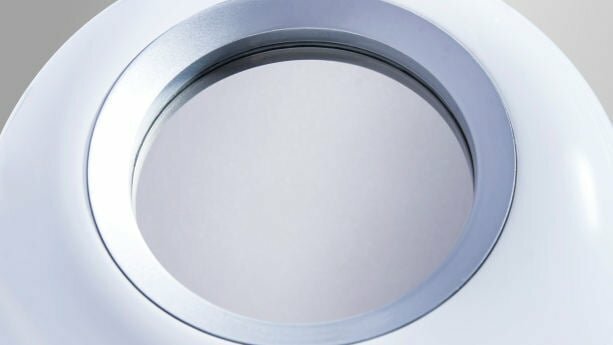 What challenges did you face during the product sample development? Well, the most important key questions at this stage was the patent search and visiting factories in Shenzhen. First of all, It’s important to do a patent search to protect your business model and know exactly what to do and when. As for the factory inspections, I personally traveled to the southern China and lived, literally, with my manufacturer every day, discussing every detail with my factor. I created a strong relationship with them and learned more about the Chinese business culture. In my impression, a lot of myths surrounding them [Chinese suppliers] are false. There are a lot of positive differences between our cultures. To have the full understanding of all the relevant process its one of the keys to success, in my opinion. Another important thing is that you must be strict about the cross-border sales, and about the quality of the item – and to remember that you can still have problems. How did you communicate with the supplier, once you’d left Shenzhen? There is also this magic tool called WeChat (Chat application). Thanks to WeChat, the response time from the supplier is very fast. As a result of that, you have a very direct dialog with my factory. That said, the language is still sometimes a barrier. You also launched a Kickstarter campaign. Where can our readers go to back your campaign? Yes, we decided to go with Kickstarter. Launching the Kickstarter campaign proved to be hard work, with a lot of unpredicted situations coming up. We have goals with gifts, Coasters, bottle openers, Posters, beer glass, bar mat… at no extra cost. But first, we need to reach our US$30,000 dollar target goal. Shipping will be by the end of September, or early October. I also offer to your readers a special affiliate discount of 7% for the purchases, please visit this page for more information. How do you plan to sell your product once it’s out? My sales channels will include both online stores and traditional retailers. If anyone reading this is interested – feel free to contact me to become a distributor. Amazon or Shopify are both parts of the plan, but we want to sign direct contracts with distributors as a long-term sales strategy. So far, businesses in Russia, South America, Europe and the United States have expressed interest. We will also need to work on our own online sales channels, and marketplaces. The market will dictate where we go in the next few steps. There is an interesting link between Amazon and Kickstarter. They have an agreement and as a result of that we have this “Amazon: Launchpad”. I consider this as one of the most interesting online sales channels during the post-campaign period. Last question. Lager or Craft Beer? I’m really excited about the new Craft beer ecosystem. There are a lot of exciting varieties, my favorites would be Stouts a and the spontaneous fermentation Lambics. Do you want to reach out to Ivan De Miguel?